In the paintless dent repair world there are two kinds of businesses, fully mobile shops who move around from town to town chasing hail storms, and then there are local shops who service a local base of customers. If you are in this second group, this post, the first in a two-part series, is for you. It seems almost silly these days to explain to business owners why they need a website for their business. We see so many companies who do all their digital marketing through one social media channel such as Facebook or Instagram. We have even seen really big body shops that only have a profile on a social media page but no website of their own. The problem with a social-only digital marketing strategy is that you are at the mercy of the ever-changing rules and whims of that platform. Take for example Facebook’s big change announced in January of this year. Facebook’s goal is to keep its users on the platform and has to continually strike a balance between what keeps people on the website and what pays Facebook’s bills. Facebook’s big announcement in January is a reaction to people who have long said they felt the site had shifted too far away from friends and family-related content, especially after a rise of outside posts from brands, publishers, and media companies. With even a basic website, you are the captain of the ship, and you are in control. You are not under the control (or at the mercy) of the owners of the social media platform with which you market. 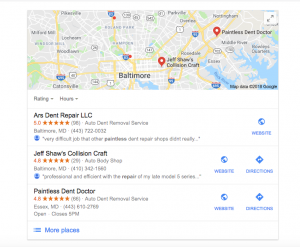 Having briefly demonstrated why you need a website for your business, let’s turn now to the instructive portion of this post: how to dominate local search for your Recon business. No matter what your business is, if you serve customers within a set territory, you are a local business and your website needs to perform that way. You have probably heard of Search Engine Optimization (SEO), and you have likely been inundated with offshore SEO companies who claim they can get you ranked #1 for just $50 per month. With local search, most small businesses are only concerned with one thing, and that is getting to the three slots in the so-called “three stack” or “Three Pack” of search engine results. The good news for local marketers is that Google has gotten really good at managing local search for businesses. Even just a year ago, it may have been difficult to find yourself on the first page of Google for your service. But with the development and enhancements to Google My business and its prominence in the search results, small businesses can rank well without having to spend their way to the top. Prominence + Proximity + Relevance= Search Result. Prominence– is how well you show up on the internet. This includes things like your website, but it also takes into account backlinks, reviews, mentions on other websites, and directory submissions, (although directory submissions are becoming less of a factor). Proximity- This is how close you are to the person doing the search and unfortunately is not something you can work on or fix aside from opening up office locations all around town. Relevance- This is how relevant your service is to what the search has asked for. As an example, you will have a harder time ranking for Auto Body Repair near me, than you would for dent repair near me, even though we both know they could often be one in the same. Your reviews also help with relevance as long as the people leaving reviews are using your keywords in their reviews. We’ll cover that more below in the tips. You could almost write a short book on how to rank high for local search, or even to place in the local pack, but to keep things manageable in this post, we are going to bullet list some key points. Your rankings are relative to those of your competitors. You might be able to do something in one market and rank number one, that wouldn’t get you anywhere in another market. If you have a strong website and you’re doing a good job with normal SEO, the odds are higher that you’ll show up in the local pack. You have to be in the proximity radius to have a chance to rank, but you have to have the other factors (prominence and relevance) to really be able to beat the competition. If you’re a service area business located in a suburb, and you want to get rankings in the big city, you should create a page on your site and optimize it for that particular city. You probably aren’t going to rank too far outside of your radius if you’re a service area business. This is something that Google needs to change, especially for businesses who travel to their customers. A lot of the relevance factor is first determined by what category and sub-category you put yourself in in Google My Business, and what the person searched for. To boost relevance, take the page you link to on Google My Business and optimize that with keywords, and also related topics. Use ‘semantic relevance’ in your pages to increase relevance. This is the practice of including keywords parallel to phrases that are important for you (e.g. ‘Manhattan’ and ‘New York City’). Aside from the SEO benefits, local link building can drive a lot of traffic directly to your site. If you have 1-5 locations, point your GMB listing to your homepage. If you have more than five locations, it’s time to start setting up location pages. Google is now getting data sources that we can’t really have any influence over, such as table reservations from OpenTable, and customer numbers from credit card companies. You can’t manipulate these things, so you just have to focus on being an awesome business, and making that awesomeness visible to your potential customers. If all this sounds like a lot of work, it is; but it is manageable. Having a solid website is the heart of this, but the Google My Business page is equally important. Stay tuned to part two of this post where we walk you through step by step how to claim, manage or modify your Google My Business listing.